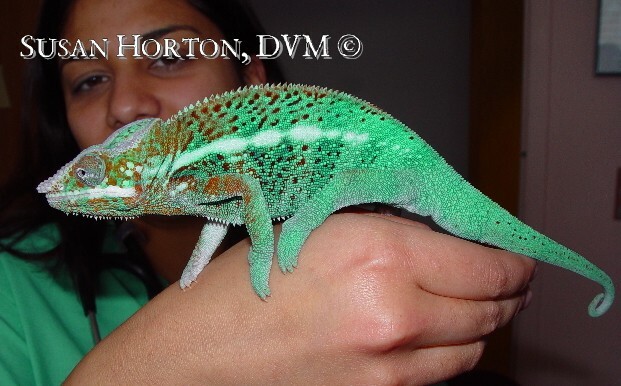 Panther chameleons have become increasingly popular pets due to their wide range of beautiful colors. 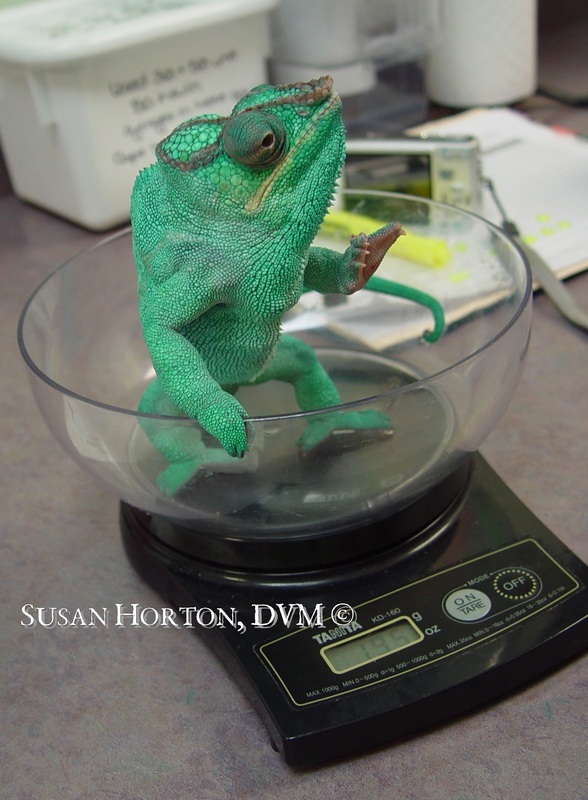 Typically, chameleons are an observation only pet and typically tolerate handling poorly. Panthers have been described as rather aggressive and truly prefer to be left to their own devices. Panther chameleons are frequently given up due to their extensive husbandry requirements. These lizards can be a hefty financial investment and an investment of time as well. Reptile rescues and local zoos are constantly asked to accept relinquished chameleons and most no longer accept these animals. Please, if you are considering this kind of pet, think long and hard on their requirements and consider adopting an adult or juvenile from a reptile rescue or purchase one from a distinguished breeder. Panther chameleons are found primarily on the northern and eastern coast of Madagascar where it’s hot and humid. This species is still very abundant in the wild today. Panthers, like most chameleons, rarely venture on to the forest floor where their specially designed feet and body shape hinder any version of fast locomotion. This is one of the hardiest chameleon species available. ​Panther chameleons can reach 15 inches in length with the males being larger than the females. 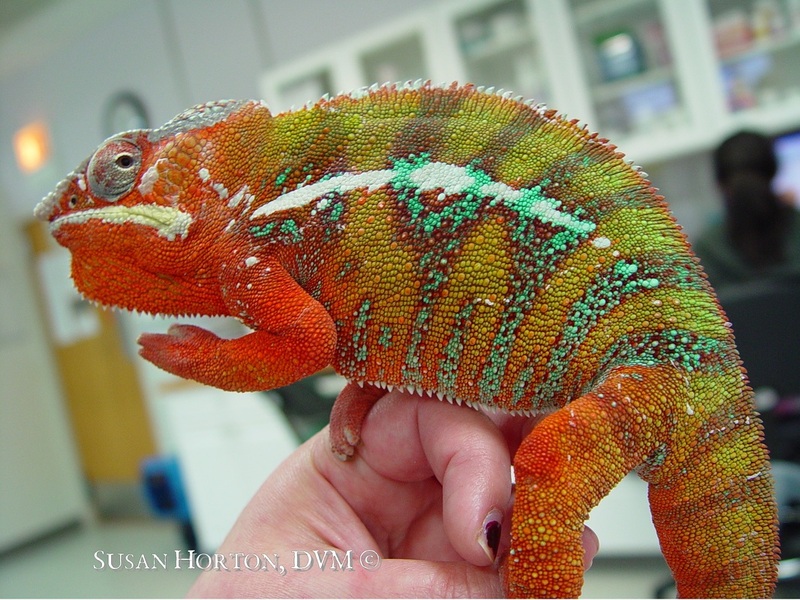 Color changing is a form of communication that relays invaluable information to the owner (and other chameleons) regarding sexual readiness, health, and in the case of Panther chameleons, depends on their original geographic location. Chameleons have amazing adaptations especially concerning the eyes which pivot on turrets and can look in two different directions at once! The tongue of the Panther chameleon is roughly two and a half times the length of the body during full extension to secure food. Care must be taken with feeding though. If a chameleon were to extend its tongue and hit a glass or plastic wall rather than the insect it could potentially sprain or severely injure the tongue. These serious injuries could potentially be permanent disabilities for your pet and require hand feeding for the rest of their life. The tail is prehensile and acts as a fifth leg for the lizard offering stabilization and a more secure hold on branches. The feet have toes that are bundled together thus offering a very strong and secure grip when coupled with the sharp nails. Chameleons in general are notorious for being intolerant towards other chameleons, including their own species and Panther chameleons are extremely aggressive towards others. Males will stress themselves to the point of illness if in constant visual contact of another male. When a chameleon meets another chameleon the threat displays (the amazingly bright patterns) light up their bodies and fighting will begin shortly after. Glass aquariums are avoided with chameleons, males in particular, due to the reflection causing some lizards to perceive another male. If an aquarium must be used for very young or sick individuals, cover three sides and the top of the cage with a towel or newspaper to keep the reflections at bay. Branches should be of varying shapes, lengths, and wood. Cotton rope avian perches are not a good branching system for your chameleon as their long toe nails start to fray and unravel pieces of the rope. If a piece of that string gets around your chameleons toes a constriction can occur and the toes could potentially be lost. Place the branches in such a way that the chameleon has access to the greatest amount of climbing opportunities. Slightly springy wooden perches should be used to allow the feet to stretch and rest a bit on a softer surface. For this purpose, reptile vine products are an excellent idea. Live non-toxic plants such as pathos and fichus can be used for enrichment in the enclosure and to provide nice young branches for your Panther chameleon to climb around. Foliage is a must for your chameleon to feel secure and should be added. The foliage, whether fake or real, will provide excellent coverage but also a water drip system as most chameleons will not drink from standing water. Normally in the wild, chameleons, like most reptiles, bask in the sun to warm up and retreat to a cooler, shady area to escape high temperatures. A basking light can be provided using a reptile heat lamp, spot light or ceramic heat emitter. The basking spot will be around 85-90 F but care should be taken to make sure your pet can not access the bulb or the lamp. The ambient temperature (air temperature) should range between the 77-81 F during the day and decrease to the mid-70’s at night. A photoperiod of 10-12 hours is essential for normal behavior. A chameleon with the lights constantly on can become overly stressed and possibly fall ill. Along with heat lamps and regular day lights, a UVB (ultra-violet B) should be supplied. These bulbs give off UVB rays which help the chameleon to synthesize vitamin D into vitamin D3. Vitamin D3 is necessary to properly metabolize calcium. Without these bulbs your chameleon may succumb to abnormal behaviors, metabolic bone disease, fractured legs, etc. One bulb will make a world of difference to your pet! Juveniles need a stronger amount of UVB than adults in theory. Healthy adults, especially ones allowed 1-2 hours of natural unfiltered (no glass or plastic between sun light and your chameleon) sun light can be maintained with a 5.0 UVB such as Repti-Sun. 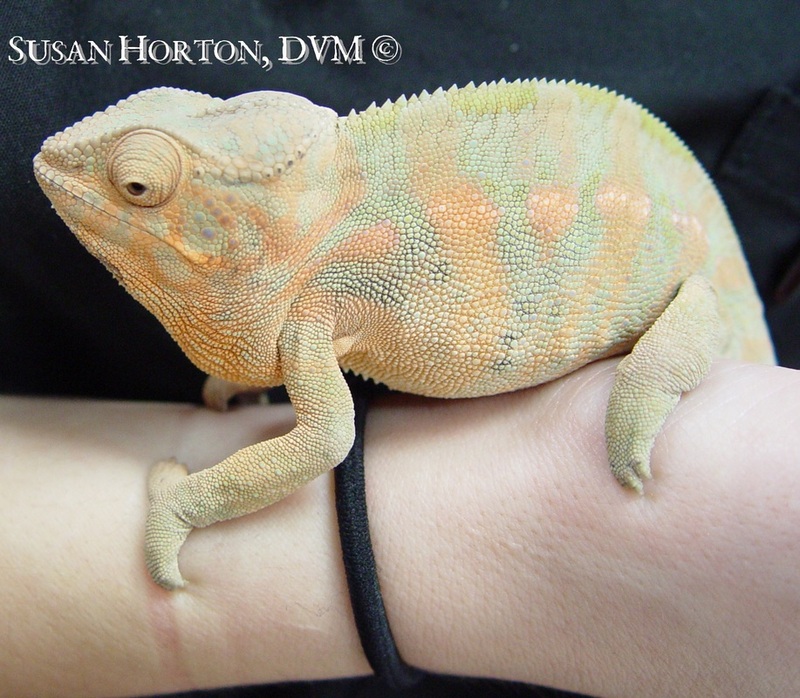 Juveniles and ill or debilitated chameleons will require a 10.0 UVB bulb. Regardless of bulb strength, all UVB bulbs must be replaced every 6 months. Even though the bulb still emits light it may not be emitting the proper amount of UVB. Substrate for chameleon cages is easily maintained if newspaper, butcher paper, or indoor/outdoor carpet. If particulate substrate is used there is a risk that the chameleon will accidentally ingest the substrate along with the prey item. Solid substrate also affords easier visualization of the chameleons’ feces and urate output. The humidity in the enclosure should be 90-100% since Panther chameleons receive most of their body fluids from breathing in humid air. Hatchlings should have access to water droplets twice a day if not more. Adults can be misted several times a day taking care to leave droplets on the leaves of foliage. Hand misters work well enough but a fog or mist system is preferred. There are many products geared towards humidifying chameleon enclosures including drip systems to help provide water at all times. Remember to clean your humidifiers and/or drip systems weekly to prevent the build-up of bacteria and molds. Soaking your chameleon one to two times a week for 10 minutes a piece helps with hydration and reduces the risk of kidney diseases caused by chronic dehydration. With Panther chameleons it is best to approach with deliberate slow movements. Position one hand under the front half of the body and carefully unwind the tail with the other hand. Chameleons do not have the autonomy ability (ability to self amputate the tail) and if the tail is injured or broken it will not regenerate. Push your fingers under the front feet and once the chameleon is grasping your fingers lift up. Never pull your chameleon off a branch or your hand forcefully! Also, when handling Panther chameleons watch that your fingers are mistaken as a moving food item as they have a painful bite. Panther chameleons eat invertebrates (crickets, mealworms, etc. ), snails, their own young, and anything that doesn’t run away fast enough but will fit in their mouth in the wild. As with all reptiles, variety is key to a balanced diet and a healthy animal. Offer high-quality crickets, earth worms, meal worms, and even cockroaches such as the Madagascar Hissing cockroach. All insects, except earth worms, must be “gut loaded” (fed a high calcium diet to negate the naturally high phosphorous level in insects). Gut loading is simple enough. Offer the live prey high calcium greens (collard, mustard, endive) and vitamin A rich vegetables (carrots, squash) for 24 prior to feeding your pet. Gut loading can also be accomplished with enriched chicken feed or cricket diets created for the purpose of gut loading. The offering of prey can be daunting to some owners. Most people do not want their lizards food wandering their home because it escaped the enclosure. Offering the prey items in a plastic cup or container helps significantly. The tongue of the chameleon is long enough to reach in and grasp the insect without as many escaped insects. This will also allow for easier food consumption monitoring. It should be noted that chameleons are prone to over eating and will do so whenever the opportunity presents itself. Most chameleons will eat every day with larger ones able to eat every other day. Hatchlings and juveniles are typically fed pinhead crickets. These are harder to keep confined and escapes are likely. However, a small plastic container may help but the hatchlings may be less inclined to use the feeding station. Close monitoring of consumption in the cage is thus essential.